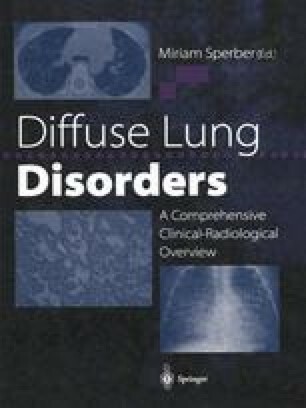 The phrase ‘diffuse lung disease’ is often used to designate diseases producing bilateral widespread infiltrates in the lung as assessed radiographically or pathologically . A glance at the contents of Part III of this book shows that the term is used herein in a more literal sense to encompass disorders that affect all regions of the lung, whether they primarily involve the airways, the acini or both. This chapter will review the pathologic responses of the conducting airways and gas-exchanging parenchyma.